She isn't in government from 35 years like you choors pepepe and ganjas. Really behad afsoos hota hai, aj kal jab hum dekhte hain, in 2 number politicians public mein aa keh non issue ko issue banane ki koshish kar rahe hotey hain. Ms. Aleema khan kiya PM house mein hain, ya party run kar rahein hain jaise, bilawal or maryam. iss tarah ke press confresson se show kar rahe hain, yeh log kabhi bhi Pakistan ke haq mein nhi rahe. always protecting corruption of PPP and PMLN, there godfathers. Anyone with an infinitesimal sliver of intelligence can see where PPPEE and PML(Najayaz) stand. Together, hand in hand, struggling against accountability. Woe to those who actually believe these degenerates. Ager kisi ney public office hold nahe kia hey kabhi to kia usey poori azadi hey k corruption karey? Pti waley har dafa ye q kehetey hein haM ney to kabhi public office hi nahe rakha. I agree with you, I don't buy that argument myself and find it extremely annoying. Here is the thing though, even if they put her on ECL which they should if her case warrants it but that's not going to stop these people from wailing. They have to defend Zardari and Nawaz transgressions. DEAR every educated people would say what u said. I JUst wanted to say parameter should be same and everyone who is corrupt should be treated same. I agree, a crime is a crime, regardless of profession. But don't you think this is just PPP and PMLN grasping for straws to avoid drowning? I mean if the news is correct that Aleema Khan has paid fine and can account for her wealth, then they're trying to breath life in a dead and irrelevant case. If not, put her on ECL as well. She should pay as well. 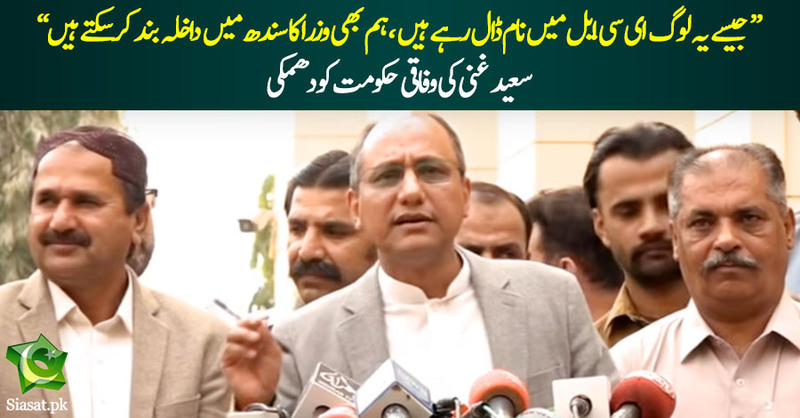 Yeh Saeed Ghani tu khud phunss reha hey JIT Report mein. Isney bhee OMNI kay plane mein privately chakkar lagaiy huway hein. Well they should go ahead and form a JIT. I'm not trying to defend her and I'm not against the formation of JIT. We've already established that a crime is a crime and should be punished. I'm talking about the political aspect of it. Do you think they're demanding her name to be placed on ECL out of sheer love and pain for Pakistan? It's all about desperation to gain some leverage that isn't there. Let's for a second assume a JIT is formed, it's independent and it clears Aleema Khan. Do you think PPP et all will just calm down and never talk about it again? So putting her on ECL just to please PPP would be a grave mistake, illegal and it will only fuel this political circus. Deja VU all over again, these people don't have the courage to confront Khan one on one so like the cowards they are always go after the women in his life. Been doing it for 20 years now and it hasn't worked yet, and won't work now either. Ayan ali was zardaris hoe aleema khan and ik are different people and yeah she should be investigated but ganjas and zardari should be preferred bcz they were in government. I know ppp and pmln are not doing this for the sake of pakistan. They just want to cash out the issue. And it will keep continue untill we have free and fair police. Are you sure? Whose Girlfriend was she? Anyone can demand it and its state responsibility to investigate it not individuals.